Welcome to the all new fortnightly Series 9 of the #CreteNature Blog with a host of new features to come. 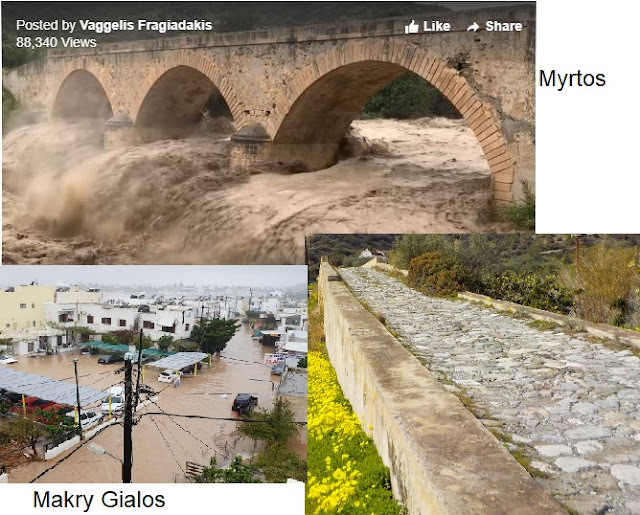 Winter is early and severe this year as the weather system 'Telemachos' comes marching through on the heels of weather system 'Sofia' and now we have storm Zeus. Not that that deters us naturalists of course and on January 7th I set off with amateur botanist Julia Cross and a small group of intrepid individuals to explore the Toplou Gorge on the north east coast of the island. 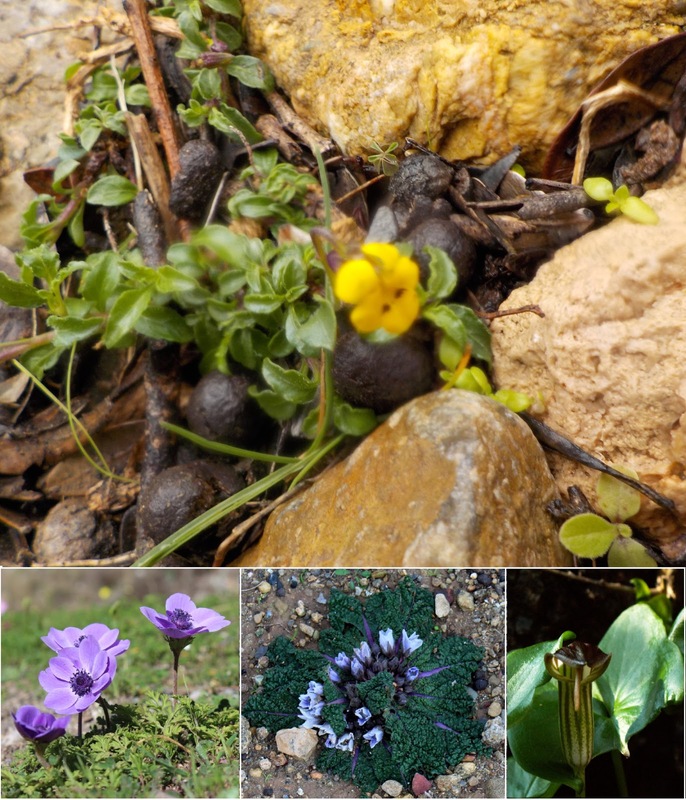 Flowers were few and far between but the Poppy Anemones (Anemone coronaria) were abundant and there were a fair few Mediterranean Mandrakes in flower (Mandragora officinarum) as well as a couple of Friar's Cowls (Arisarum vulgare). Pride of place however must be given to a small yellow job with a couple of black dots which Julia informed me was a Scorpion Violet (Viola scorpiuroides). This was originally a north African plant but can now be found in east and west Crete as well as on the islands of Kythera and Antikythera. Sorry about the quality of the photograph but the light shower in which we'd set off had now turned to freezing rain. The rain turned to hail, we sheltered under a carob tree and I had an irresistible urge to cuddle up to one of the big, hairy goats nearby for warmth. These proved to be virtually the only animal life that we saw that day. I heard a few larks and a solitary raven but everything else had more sense than to be out in that weather. We waited until the hail had stopped bouncing off the goats and continued down past some caves that definitely looked worth exploring on a warmer day. At the bottom of the gorge we came to some large pools where I found some Whirligig Beetles of the Gyrinidae family spinning around like tops which is fairly characteristic and some nice green algae of which I took a sample to look at under the microscope later. We didn't stop long at the pools as none of us had had the foresight to bring our swimming costumes but trekked back up the adjoining ravine which involved a short but somewhat steep climb of about 200m and made me realise that I was still carrying a fair few pounds of Christmas fayre. Still, thank you Julia & Co. for an interesting afternoon in good company. This would make a nice day trip from nearby Sitia (15mins by car), Makry Gialos (1 hour), Ierapetra (1 hour 30 mins) or even Agios Nilolaos (1 hour 45 mins). Use the #CreteNature interactive Hiking and Nature Map for routes. The walk starts from the north side of the main road about 200m to the west of the Toplou monastery. There is a small route map on a post. Wear trainers, be prepared for a bit of scrambling, follow the splashes of red paint on the rocks and remember to tie the gate shut behind you about 100m from the start. This is one of the new sections I'm building into the blog which I hope will be of interest. This tip concerns using trees as compasses. Every area of the world has a prevailing wind direction. Here in Crete the prevailing wind comes from the north west (in England it is from the south west). Trees in exposed locations, like these at the end of the Toplou Gorge walk, point in the opposite direction from the prevailing wind, i.e. south east. If the location is not so exposed as to make the trees lean in any obvious direction take a look at the roots. The strongest and longest will point in the direction of the prevailing winds as this is where the tree needs the most support. And another new section. Actually, a bit of a misnomer as the lab is still in the planning stage and bits of it are strewn all over the house and garden at the moment. 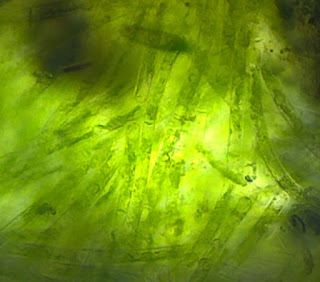 However, the green algae that I sampled from the Toplou Gorge pools was duly placed under the microscope and looked like this at x1600 magnification. These are desmids of the genus Mougeotia who, rather than pulling carbon dioxide from the atmosphere to get the carbon that they need for photosynthesis, extract it directly from the limestone. The little fish like organisms with the red eyes that you can see towards the top of the picture are single celled flagellates called Euglena.